NWWT is very fortunate to host Ashley Harwood from Charleston, SC this month. Ashley is recognized as a premier bowl turner and teacher. Ashley Harwood currently lives in Charleston, SC, where she creates her work and teaches at her personal studio. She has demonstrated in a number of professional venues throughout the US and abroad, as far away as Australia. Her teaching focuses on fine spindle turning and the Push Cut method of bowl turning along with the 40/40 grind on a bowl gouge. She received a BFA from Carnegie Mellon with a focus in sculpture and installation, and her design aesthetic is heavily influenced by her background in glassblowing. Ashley focuses on works that are completed entirely on the lathe, without carving, texturing, or burning. She uses simple, classic forms along with distinctive design elements that result in an approachable body of work with a high level of craftsmanship. Primarily, she makes utilitarian bowls, ornaments, and jewelry. Her teaching has a strong focus on tool control and sharpening. Ashley has studied with Stuart Batty and our own local premier bowl turner, Dale Larson. I have one of Ashley Harwood's bowls in my collection. It is beautiful. I think it is important to be exposed to different ways of turning. I learned a little from Richard Raffan, Ray Keys, John Jordan, Mike Mahoney and many others. Then I developed my own style and ways that work for me. 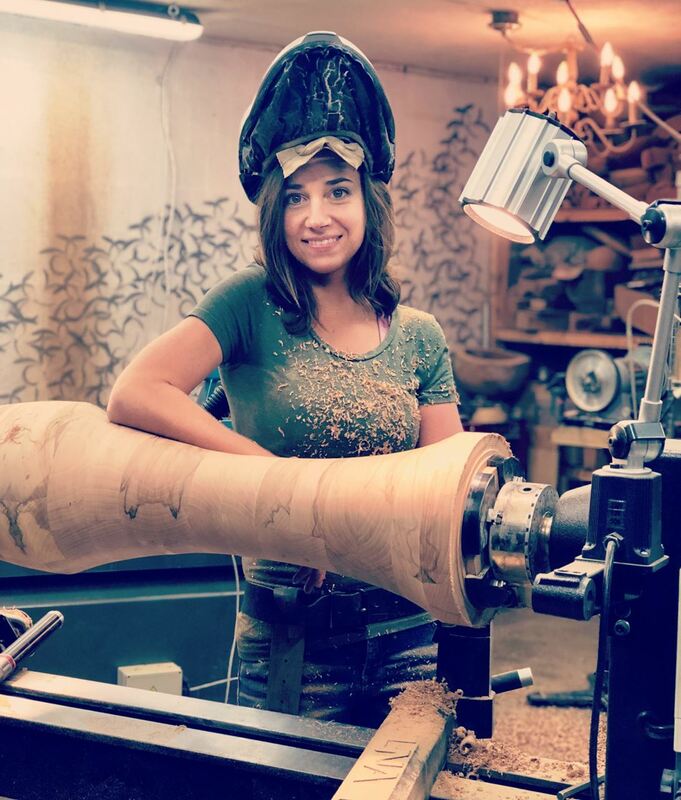 Ashley offers an approach to woodturning that is unique. She understands wood grain and how to use the tools. She uses tools and tool grinds that work for her. She is a good teacher. You will be able to pick up some pointers and methods that will make your life easier in the shop. She will present a custom program for us at the Club meeting, then will teach an all day hands on class the next day, Friday, and an all day demo on the following Saturday. See separate event postings for details of those events.